Popcorn Time is a multi-platform, free alternative app to other subscription-based movies and TV show streaming services such as Hulu and Netflix. This Android TV box software client is designed specifically as an APK or Android app that must be side-loaded onto your Firestick or Fire TV device. You’ll have access to a nearly unlimited selection of Movies, TV Shows and more after installing the free Popcorn Time online streaming video app. Download Popcorn Time and install the Android TV APK file easily on your Firestick or other Amazon FireOS device with the following directions. You’ll find the fully illustrated version of this guide to download Popcorn Time and install farther down the page. If all you need is this condensed version of the installation instructions, just make sure you first enable apps from unknown sources by going to Settings>Security>Unknown Sources. Download and Open Downloader App. Open browser tab keyboard with Firestick remote to see the URL box. Type https://mytm.pw/pt then click Go. When the Download finishes, click Install then Open. When using free streaming apps such as Popcorn Time APK, a securely encrypted VPN is highly recommended to hide your identity, location, and online activities. Many experienced free video streamers, including everyone here at My True Media, prefer IPVanish VPN. Popcorn Time was made to be used on Android devices with no thought to Firestick remote access for watching it on a TV screen. A mouse or touchscreen is needed to access some of the features within the Popcorn Time APK app. We have an easy solution to this problem, though. Installing Mouse Toggle on Firestick or Fire TV allows you to use an onscreen cursor as a virtual mouse with your Fire TV remote control. Learn more about this utility app in our How To Install Mouse Toggle on Firestick & Fire TV article. Once Mouse Toggle has installed, you can enjoy Popcorn Time APK on Firestick in its entirety. Follow the illustrated guide below to install Popcorn Time on Fire devices. This install tutorial is visually demonstrated on an Amazon Firestick. Please note these same steps can be used to install Popcorn Time APK on Fire TV, Android TV Box, NVIDIA SHIELD, or nearly any other device running the Android operating system. Whenever installing an app not found in your FireOS or Android device’s home app store, you must enable apps from unknown sources. Note that the Popcorn Time APK written about in this article is found in neither the Google Play Store nor the Amazon App Store. 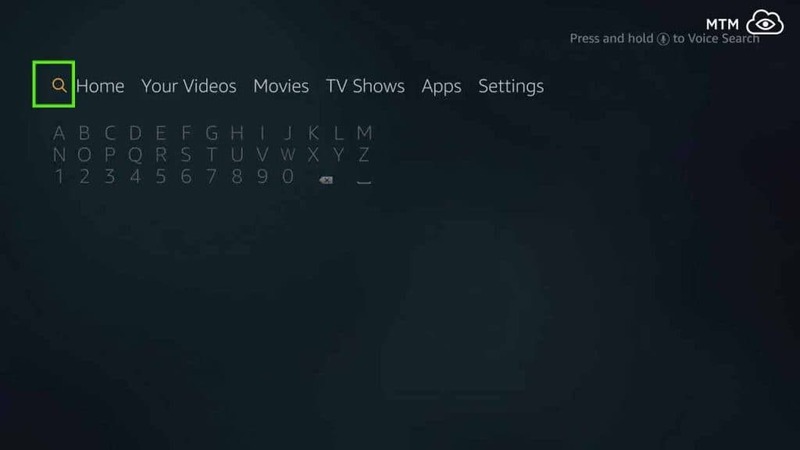 From the Firestick Main Menu hover over Settings. Within Settings, click on Device. Choose Developer options from the center menu. Next, choose Apps from Unknown Sources. Click Turn On to show you understand the implications of Apps from Unknown Sources. If installing on an Android Box, NVIDIA SHIELD, Mi Box or another Android device, you still must install the Downloader app on your device, then jump ahead to using Downloader App to install Popcorn Time. The following section is exceptionally verbose and explicit for those having no experience with downloading apps onto Amazon Firestick. Head back to the home screen and move to the search (spyglass) icon. Type downloader in the search function until you notice Downloader appear in the list below. Scroll down to Downloader and click on it. Click on the Downloader App. Then, click Download, which will download and install the Downloader App. Clicking the yellow Open button to launch Downloader App. Then, click OK for update notes for Downloader App. Click OK button on remote to open the URL input. In the URL address bar, type https://mytm.pw/pt then click Go. Wait for the file download to finish, then click Install. Next, click the back button on your remote to exit. Now you’ll see the main menu of Popcorn Time. Important! Ensure that your device has adequate free storage space available before using Popcorn Time APK. The BitTorrent technology utilized by Popcorn Time downloads portions of the media file in advance of playback. This download cache can cause buffering or freezing of your stream if adequate empty storage space is not available. When exiting Popcorn Time, the cache that holds this data will be automatically emptied. No further actions are required to free up space used by Popcorn Time when streaming videos. Another thing to note when using Popcorn Time is the BitTorrent technology used to stream works both ways. As Popcorn Time downloads the video file and presents it to you, it also makes the file available to other Popcorn Time users from your streaming device. Some of the video sources found by Popcorn Time are not properly licensed for distribution in this way. In many areas, this sharing of unlicensed video content is against the law and can get you in serious trouble. Be sure to research the laws in your area. It also pays to protect yourself by only using Popcorn Time anonymously with the IPVanish VPN app. Popcorn Time is just one of many awesome FREE third-party apps available for installation after Jailbreaking your Fire TV device. To learn how to jailbreak your Firestick and gain open access to all streaming experiences online, read our complete MTM Jailbreak Tutorial article. You can also check our list of best Firestick apps if you’ve already jailbroken your Fire TV. Now that you have Popcorn Time installed on your device, enjoy browsing through the multitudes of titles. Once you select a Movie or TV Show you want to watch you’ll be presented with a few options. These options include playing, downloading, viewing the trailer, resolution, language, titles and more. To access the settings and search bar for Popcorn Time simply long-press your left button on your remote. As mentioned, Popcorn time uses BitTorrent technology. This makes it a great application for those with slower internet speeds. A portion of the media file downloads to your device prior to playback to ensure against buffering, stuttering, freezing, and other interruptions. Popcorn Time has received tons of positive media attention. Many compare it to Netflix for ease of use and high-quality streams. Note that as a result of using BitTorrent protocol, your IP address is shared publically while watching media with Popcorn Time APK. You must install and take advantage of a VPN service when streaming free movies and TV shows with it. Otherwise, you will most likely receive warnings from your Internet Service Provider or worse.